Awww... now I want to cook something using bacon.. Danger: Reading online forums may cause irreparable damage to your faith in Humanity. Looks yummy! On the travel channel & food network a store was shown that sells these, and donuts with a similar topping. Oh yeah. Cupcakes and a Mountain Dew ! A girl at JUST work brought in cupcakes and I made a joke that they had bacon in them, because one guy eating them is a vegetarian. Bacon is the most Delicious of Vegetable. The local morning news show did a piece on these things. 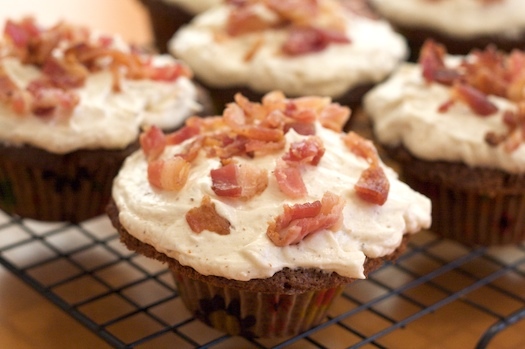 Seems a bakery in Philly was pushing the bacon cupcake thing pretty hard. Funny part was watching the really really pregnant newslady eat half the cupcake then gag on the smell as it sat in front of her on the desk.